After nearly 20 years of DJing in clubs, festivals, and parties, I’ve been looking for new venues that are more in line with my personal life. With a focus wellness and spirituality, staying up until 6am and traveling constantly hasn’t been appealing for a while, and I’m pretty much retired from that circuit. An unlikely place that has been working quite well for me is in the land of yoga. 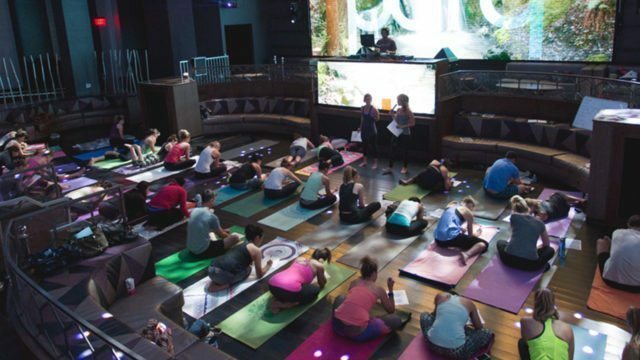 In a yoga class, there’s a captive, conscious audience – and much more friendly working hours. After DJing a dozen yoga classes over the past few years, I would like to share my knowledge with you. 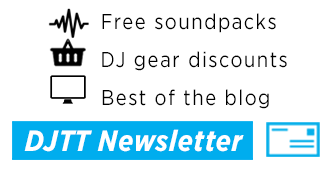 DJTT reached out to a few active DJs who play yoga gigs as well for this article – look for tips from Flashflooder and Lola Villa as well as my own experiences. 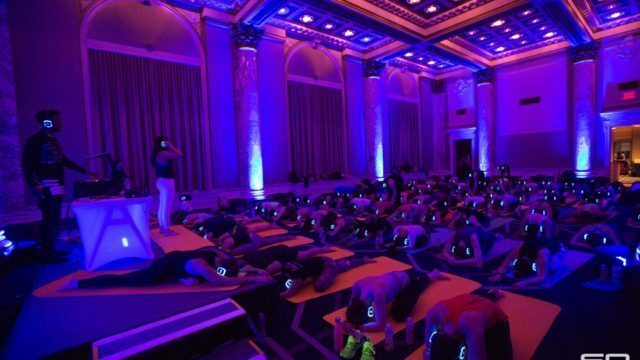 What Is This Yoga/DJ Combo Like? The class I play regularly is a fairly standard energetic vinyasa flow that lasts for 75 minutes. The difference is that the yoga teacher and I are interacting with each other throughout the class and improvising on the sequence of moves depending on the energy we notice in people that day. She might react to the music that’s playing and bring people up, or I might react to a seated posture and settle the mood down. I maintain a rolling sequence of songs that keep things interesting, and provide breaks (just like a dance floor) while the teacher is connecting appropriate poses for a quality physical experience. If we get synced up, the class gets the best of both worlds: a great teacher and a musical lift. 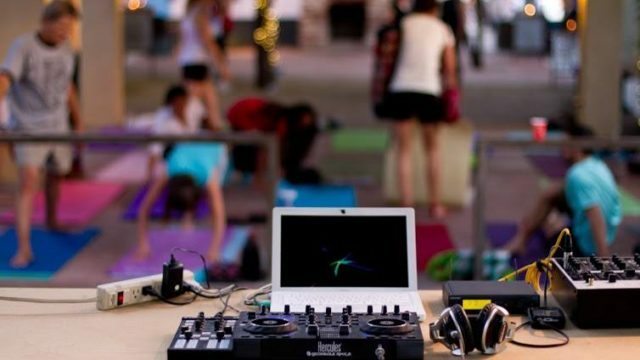 DJing A Yoga Class is Harder Than You Might Think! Is the teacher speaking right now? What is he/she saying? Do I need to make room? What is my next mix in/out point and song? 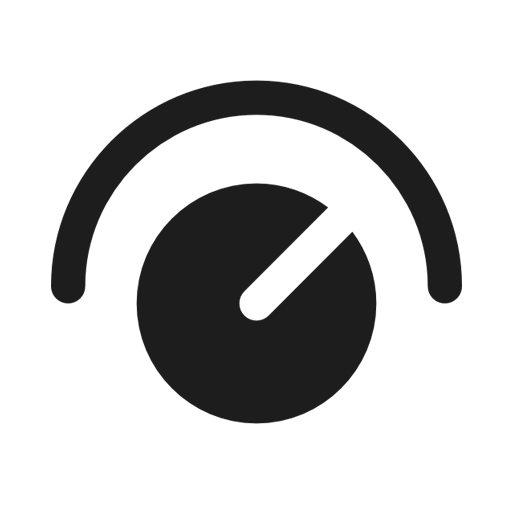 What is the current energy level of the room, and is it appropriate for the current musical direction? When is the next section? High or low energy, and where in a progression of moves are we? Beyond the basic mixing, picking the next song, and maintaining good levels; I am also constantly reacting to the teacher and providing space for their instructions. The DJ needs to be ready to shift directions on a dime. Transitioning from an uptempo pumping vibe back to a more spacious relaxed mood – hopefully while mixing it all flawlessly. The end results, when they work, are beautiful. It’s a similar energy to a dance floor, but with the added improvisation of a teacher who will throw you curve balls. 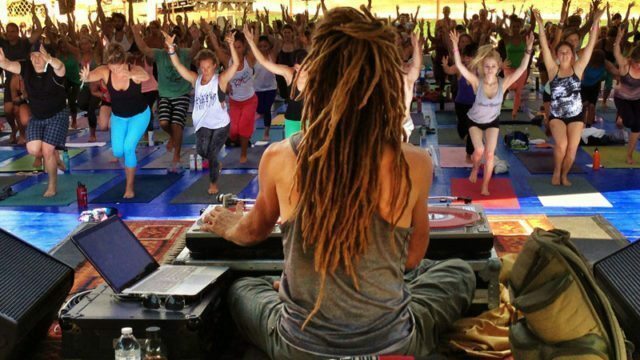 There’s not much money in yoga, and especially not for a yoga DJ, but the personal reward is huge. 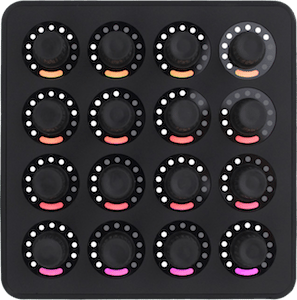 It provides me with the opportunity to practice mixing in a challenging way. This is the biggest, and also most challenging. I have taken classes where the teacher is forced to shout over an oblivious DJ who is searching through his computer looking for the next track. Students can’t hear the teacher’s cues and end up getting lost in the flow. for the students to clearly hear the teacher’s instructions. Live ducking is quite simple. Not with all words, but when a teacher is saying something important, slightly duck the volume levels of that deck by 30% or so. 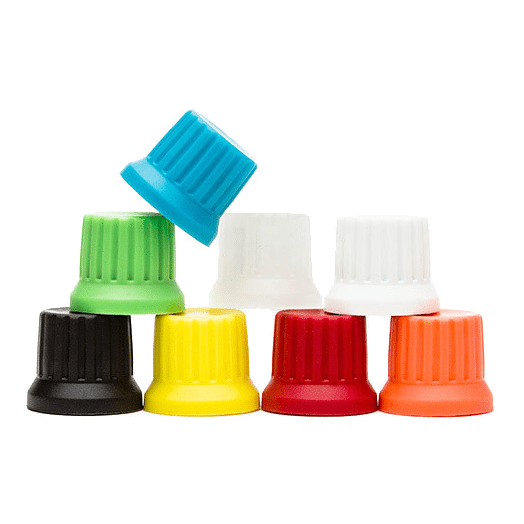 You can use the volume faders or filters (my favorite) to create space. Like a pair of dancers working off each other, this is a two person art. Rather than responding to a dance floor, you need to work off the yoga teacher and whatever sequence of poses are currently happening. Some teachers will simply respond to the music you’re playing, but ideally it is an active “conversation”. For example, in a vigorous vinyasa class, there are times when having a very energetic beat helps people maintain a high level of energy – but they’re likely to get exhausted. The teacher will probably switch to some seated poses for a while to let people cool down, and you should be ready to drop to a lower level pretty quickly. If possible, I like to really demarcate these sections with BPM changes, but sometimes just a shift in key or musical energy is enough. These sections can sometimes be communicated in advance, but like a DJ, they are usually improvised on the fly. You have to be ready to shift gears quickly. I manage this by keeping my yoga music well tagged with energy levels and proper labels for moments like “opening” or “ending”. There’s almost always a gentle intro and usually a relaxed shavasana (or corpse/lying pose) where people are in a serious resting state. Plan for these moments and come prepared with a few pre-selected ambient tracks that fit those moments. Let’s be realistic. Ducking for the teacher all the time and reacting to the energy of the room is a full-time job. Add in searching for the next track and it becomes impossible. As a result, I like to plan out many of my mixes, but not the full set. I’ll have a series of sequences planned (read more on this concept here) and can improvise on their order. This allows me to focus on the room, which is vitally important (as noted in the previous section). Attending other DJ-accompanied classes is best way to notice what style of songs really worked in a yoga context. 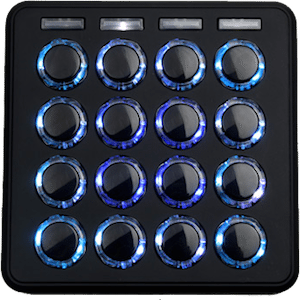 Some of these insights are often counter-intuitive to what a DJ might think. For example, I found I enjoyed older pop music with words that were fun and made me smile – but as a DJ that’s the last thing that might make it into a set. There also are many different styles of yoga, each with their own flow and perspective. 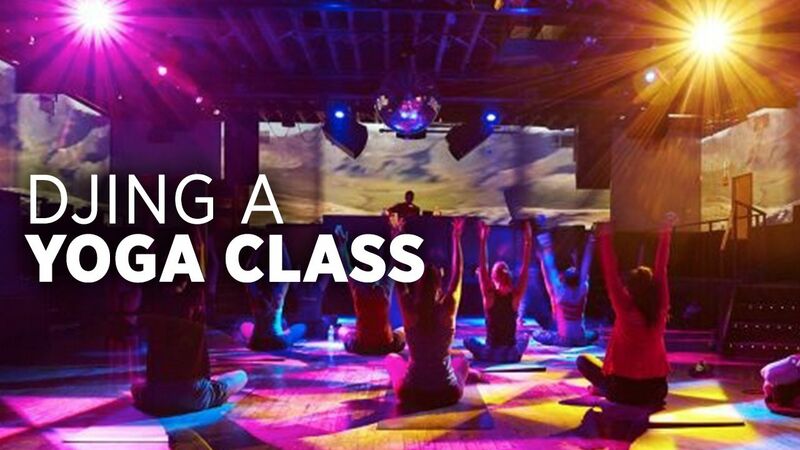 Any DJ who is considering playing a yoga class should first develop their own taste and unique composition.